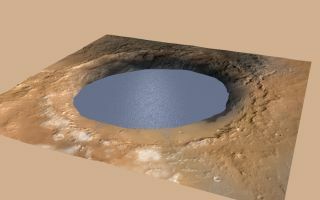 This artist's illustration shows a lake of water partially filling Gale Crater on Mars. Image released Dec. 8, 2014. The origin and evolution of Mount Sharp have puzzled mission scientists since before Curiosity's November 2011 launch. But the rover's recent observations at and near the mountain's base have brought the picture into much clearer focus, researchers said. At multiple locations, Curiosity noticed beds of sandstone sloping toward Mount Sharp. On Earth, such "inclined beds" are seen at deltas where rivers once emptied into lakes, said Curiosity science team member Sanjeev Gupta of Imperial College London. And that's likely what created the features on Mars, he added. "These are likely to be quite small, maybe a couple of meters water depth — so very, very small deltas, but certainly clear evidence that we're building out, likely, into a standing body of water," Gupta said. NASA's Curiosity Mars rover, looking toward the west, viewed inclined strata at "Zabriskie Plateau," northeast of the "Pahrump Hills" outcrop at the base of Mount Sharp. Image released Dec. 8, 2014. Curiosity also spotted rocks with rhythmic, millimeter-scale banding at an outcrop at Mount Sharp's base called Pahrump Hills — something the robot had not seen before on Mars. Here on Earth, such finely banded rocks form when sediment rains down softly, so they're strong evidence for standing water, said Curiosity project scientist John Grotzinger, of the California Institute of Technology in Pasadena. "We don't imagine that this environment was just a single lake that stood for millions of years, but rather a system of alluvial fans, deltas and lakes and dry deserts that alternated for millions, if not tens of millions, of years as a connected system," Grotzinger said. "The resolution of the paradox is to acknowledge that the layers represent a time when water was flowing from the crater rim toward the crater interior, and it filled up a series of stacks, and then subsequently those stacks of layers were eroded" to form Mount Sharp, Grotzinger said. Curiosity rover spotted an example of a thin-laminated, evenly stratified rock type that occurs in the "Pahrump Hills" outcrop at the base of Mount Sharp on Mars. Image released Dec. 8, 2014. Mars must have been a very different place about 3.5 billion years ago than it is today to support the Gale Crater lake, said Curiosity deputy project scientist Ashwin Vasavada, of NASA's Jet Propulsion Laboratory in Pasadena: It had to have been warmer, wetter and with a much thicker atmosphere. "Maybe what we see can be explained as a result of shorter-lived warm and wet climates, created either by volcanism, orbital changes [or] large asteorid impacts, all of which were active at the time Mount Sharp was forming," Vasavada said. "Each event may have created warm and wet conditions for hundreds or maybe thousands of years, perhaps enough to fill Gale Crater with one more layer of sediment." The Curiosity rover reached Mount Sharp's base in September of this year after a 14-month trek. The rover spent its first year on Mars near its landing site, where it found strong evidence for an ancient lake-and-stream system that could possibly have supported microbial life long ago. The latest results strengthen and extend those original conclusions.